Uber drivers and campaigners out on ‘strike’ on Tuesday have attempted to occupy Uber’s central office in London. 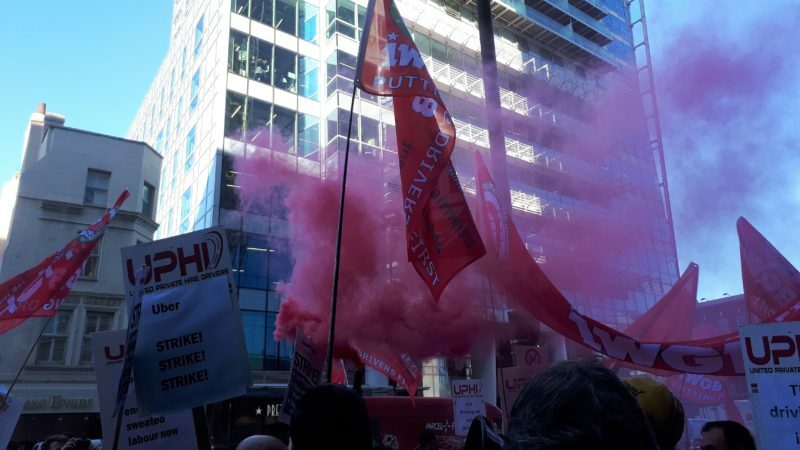 The 24 strike, which began at 1pm, is organised by the Independent Workers of Great Britain and has seen Uber drivers in London, Birmingham and Nottingham go on strike. They are demanding an increase in fares, an end to ‘unfair deactivations’ of drivers, and that Uber respect recent rulings on worker rights. “They’re not taking us into consideration. We need to know what’s going to happen. The app is our livelihood. “When we can’t refuse rides, they’re forcing us to do a job. We are the government going to take action?” He said they are going to protest or ’strike’ again. Many of the Uber drivers Josiah spoke to said they’d go on strike again and they were angry Uber were refusing to talk to them or even acknowledge them. They were demanding union recognition. Left Foot Forward also spoke to an IWGB spokesperson who said Uber are ‘in denial’ about the campaign and haven’t responded to the strike. A spokesperson for Uber told this site that claims of unfair deactivations were ‘untrue’, saying they only stop people from being able to drive with Uber in ‘serious circumstances’ – for example over a serious safety incident, fraud, refusal to take a guide dog, or breaking the terms of their private hire licence. “Drivers are not deactivated simply for cancelling ‘a few’ trips,” LFF was told. The drivers say they plan to take action again. While no date for further action has yet been set, the IWGB and co-claimants Yaseen Aslam and James Farrar will be facing Uber at the Court of Appeal on 30 and 31 October on the landmark employment rights case. There will be a rally on the 30th.